Dominica, although known for her secret hideaways is always bursting to let her secret out! Just 15 minutes from the capital of Dominica “Roseau”, in the village of Wotton-Waven lies a series of sulfur spas, wrapped in the lushness of the greenery at Wotton-Waven, furnished with a scenic backdrop of landscaping all put together by a local roots man nicknamed Screw or as some call him the IRIE Man. Screws used his skillfulness and worked with nature to construct what is now the most famous hot water spring on the island of Dominica. Many visitors from near and far come to enjoy themselves in these sulfur spars. There are several pool having their own temperature ranging from Hot to cold, a great treat for health and beauty conscious visitors. 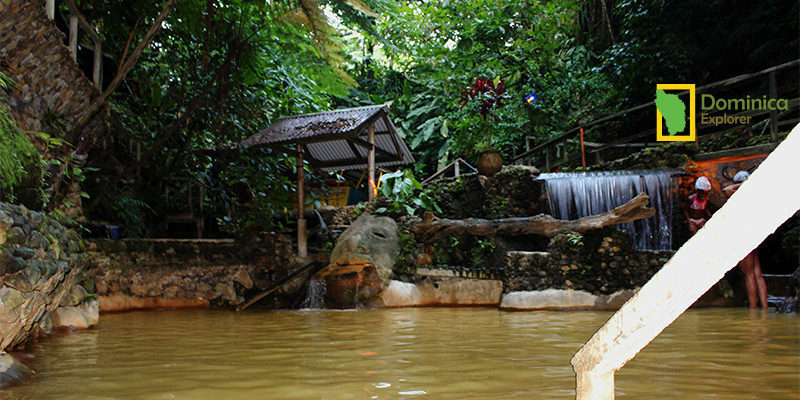 The mineral content of these natural flowing sulfur springs has been known for its healing properties including relaxation of the muscles and rejuvenation of the skin. The soothing theoretic bath will be sure to bring out the youthfulness in you. The Uniqueness of this attraction and it’s friendly staff cause Screw’s sulfur spa to standout! Making it one of the most sort after destinations on the Island of Dominica.